In 2016, DRAW was shortlisted out of an initial list of hundreds of artists to create public art for a transit station on the Purple Line in Prince George's County, Maryland. Print Veils was developed in response to our research on the site and the "International Corridor" community in which it is situated--a community dominated by immigrants from Central and South America, Africa and Southeast Asia. Through the use of educational outreach and a unique sculptural record that diffuses the negative connotations of fingerprinting, Print Veils celebrates fingerprints as a misunderstood trait that which simultaneously connects us as the same while defining us as different. The project is comprised of four large scale laser-cut aluminum fingerprints, attached to the overhead glass canopy of the transit shelter. Powdercoated in the same purple color as the transit line, the work's color also reference the chemical Ninhydrin, a purple solution traditionally used to detect fingerprints. 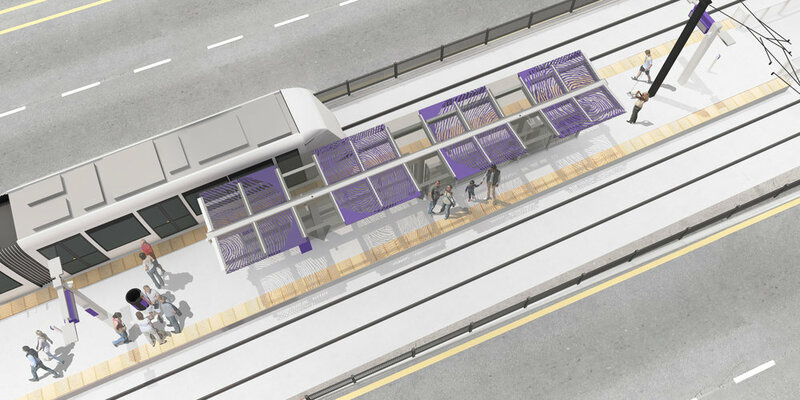 Aside from providing a distinctive overhead pattern to pedestrians and vehicles, the veils provide shade those waiting for the train. In a political and social climate where issues of ethnic and individual identity are at the forefront, Print Veils is a community-based public art project intended to celebrate individuality through the embrace of a physical characteristic that we all share: fingerprints. The project strives to celebrate the good things that happen when we as a society refrain from dividing people into “us” and “others”. We are all human. We are more alike than we are different. The presence of four large scale fingerprints overhead, in combination with the intricate shadow play on surfaces below, reinforces the message: individuals, each worthy of consideration and respect, live here.